With your toilet bowl in position, you’re ready to add the tank. Lay the bowl on its side on a towel, and install the rubber gasket on the outlet. Insert the bolts provided, with washers, per instructions now. 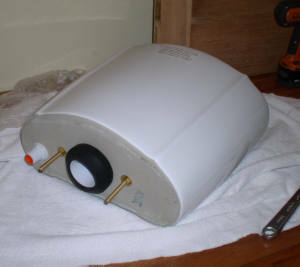 A standard setup would be bolt with rubber washer inserted from inside the tank, secured with a nut and washer on the bottom. This positions the bolt to attach the tank to the bowl and at the same time seals the bolt holes. The factory may have applied tape or elastics to flush parts for shipping. Likewise, the chain may have been hooked onto itself so it wouldn’t flap around. Remove tape and elastics and free the chain now. It’s a lot tougher to do when the tank’s full of cold water. Position the tank over the bowl, with the bolts extending through the holes on the bowl. Apply the nuts and washer provided, tightening evenly and gently on either side. You can use a level to keep the tank level. Attach the supply hose to the tank and tighten it by hand. Supposedly, you can tighten it sufficiently using only your hand, but more often than not, that’s not quite enough to stop leaks. You may need to use a wrench to snug it up just a little bit more. Turn on the water supply and look for leaks where the hose is connected to the valve and to the tank, and check that the tank isn’t leaking at the bolt holes. If it is, tighten trouble areas a little more. If everything’s good, try flushing. Adjust the float level if need be, and pat yourself on the back. We’ll wrap up next time by summarizing some tips, tricks and things to remember.